If you say his name three times you summon the extravagant ghoul with only one thing on his mind?Dare I say it? Beetlejuice, Beetlejuice, Beetlejuice!! *One Beetlejuice wig with crazy grey-white hair and mouldy looking extended latex forehead. If you say his name three times you summon the extravagant ghoul with only one thing on his mind? Dare I say it? Beetlejuice, Beetlejuice, Beetlejuice! 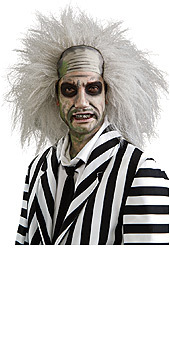 This Beetlejuice wig completes the BeetleJuice Adult Costume.